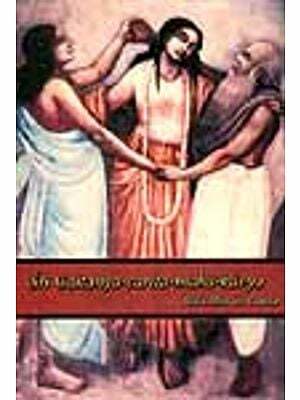 This book is based largely on two Sanskrit works of Lakshmana Sarma, Sri Ramana Hridayam and Guru Ramana Vachana Mala. The status of the world, the soul, the egoless state and merits of devotion are all lucidly explained so as to help the serious seeker understand the teaching of Sri Bhagavan. The author chooses to write under the pseudonym ‘Who’. 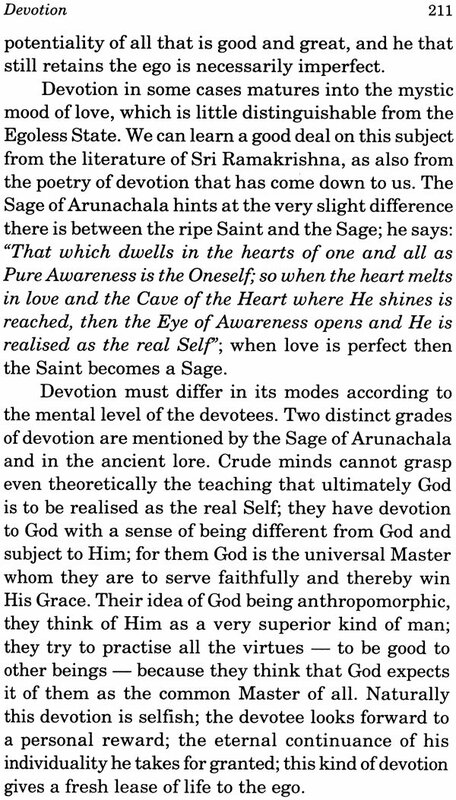 Lakshmana Sarma summarises the teaching of Sri Maharshi. He also gives a clear summary of the entire Vedanta embodying in particular the exposition of Shankaracharya. 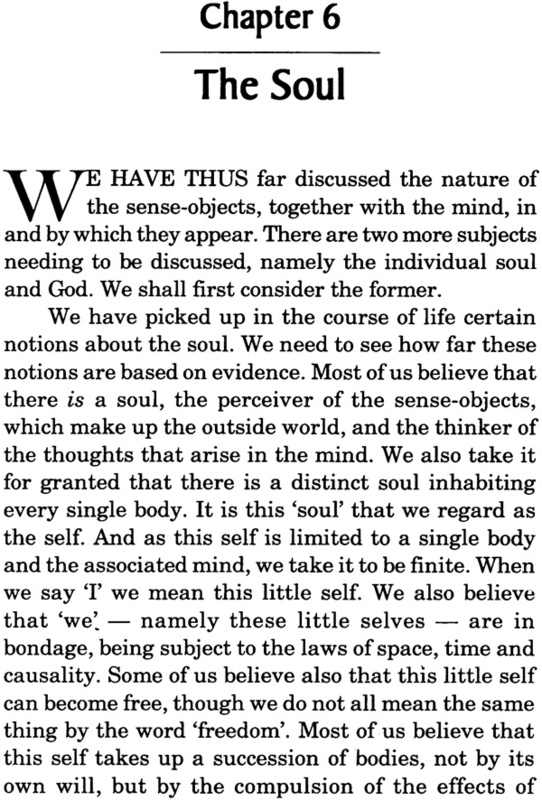 In effect we see the perfect parallelism between the teachings of the Upanishads and those of Sri Maharshi. The method of Self-enquiry advocated by Sri Maharshi has an intense orientation towards practice. 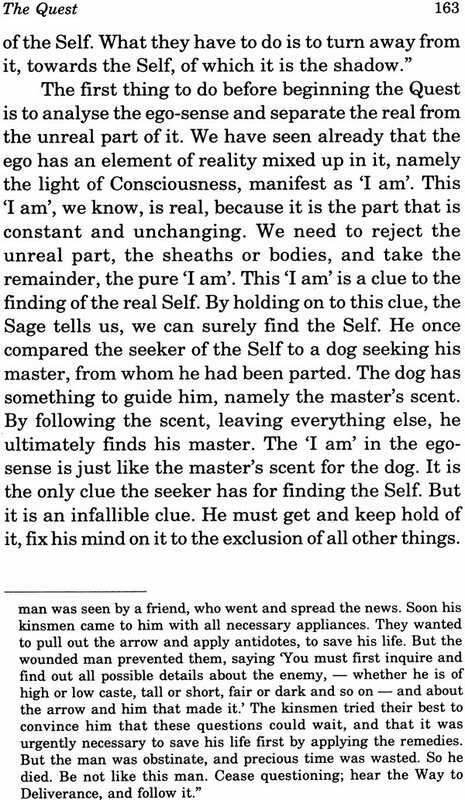 This means enquiring into the source of ‘I’ which leads to the extinction of the ego, that is, the illusory ‘I’. Thus Self-enquiry leads to Self-Realization. Lakshmana Sarma had the good fortune of spending nearly twenty years in the immediate proximity of Sri Maharshi. He used to spend the maximum possible time in Sri Bhagavan’s hall so as not to miss any single episode or statement by Sri Bhagavan. 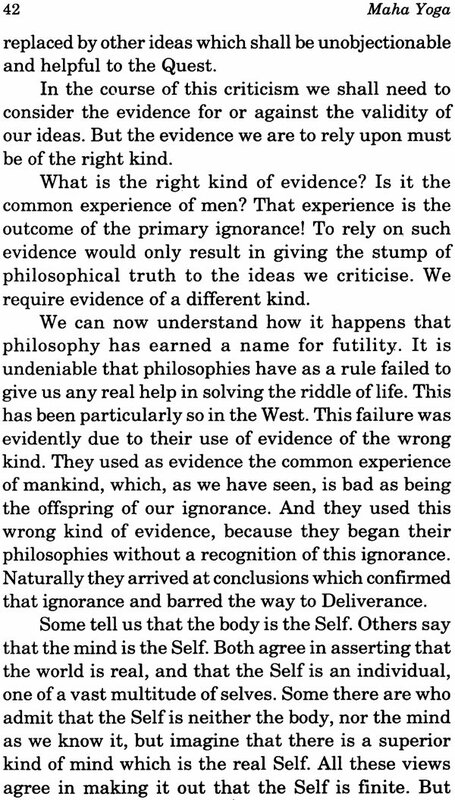 In this book the author passes the philosophical portion of Sri Ramana Maharshi’s teaching through the Advaitic acid-test, and then declares the teaching to be genuine coin of the Advaitic realm. For the author is a keen and uncompromising upholder of the doctrine that the world, God and the individual soul are really a unity and that their seeming separateness is but an illusion. 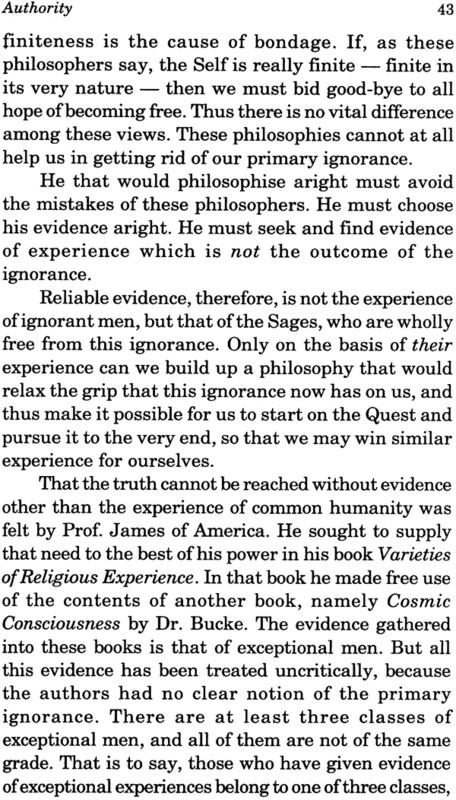 I am not sufficiently competent a metaphysician to pass judgment upon his conclusions, but I perceive that he states his case and rallies the Master’s statements to his support with a convincing and unhesitating pleading that must be difficult to refute. 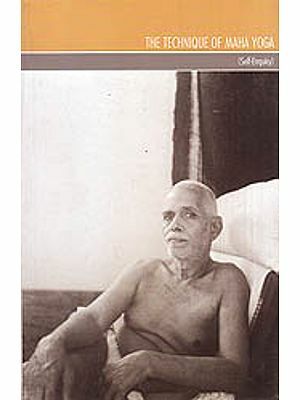 At any rate he has added many true points about other aspects of Sri Ramana Maharshi’s teachings – such as the nature of the personal ego and the necessity of devotion in some form or other – and he writes with such clearance of thought and expression that I have frequently admired both his mind and his literary style. It is with some pleasure that I recommended this book to the notice of those interested in the metaphysical side of the Maharshi’s writings and sayings. Maha Yoga or The Upanishadic Lore in the Light of the Teachings of Bhagavan Sri Ramana is both a profound exposition of Sri Ramana’s teachings and a lucid summary of the whole Vedantic philosophy, the ancient lore of the Upanishads. 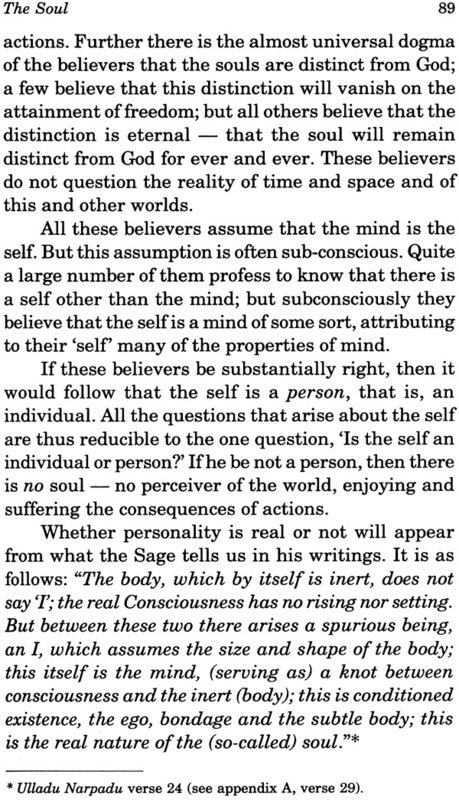 Before an aspirant embarks upon the practice of Self- enquiry, which is the cornerstone of Sri Ramana’s teachings and the essence of the Upanishadic lore, it is extremely useful — if not essential — for him to have a clear and well-founded understanding of the theoretical background upon which the practice of Self-enquiry is based, and such an understanding is possibly not made available to aspirants anywhere so clearly as in this book, which elucidates many important aspects of Sri Ramana’s teachings. 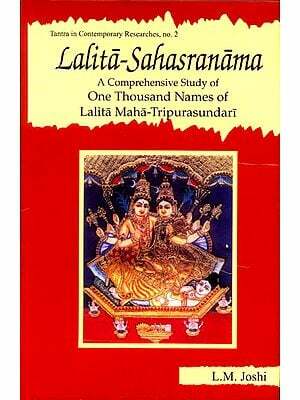 The author of this book, Sri K. Lakshmana Sarma (‘WHO’), was amply qualified to write such an exposition, because he spent more than twenty years in close association with Bhagavan Sri Ramana and he made a deep study of His teachings under His personal guidance. One day in 1928 or 1929 Sri Bhagavan asked Lakshmana Sarma, “Have you not read Ulladu Narpadu?” Lakshmana Sarma replied that he had not, because he was unable to understand the classical style of Tamil in which it was composed, but he eagerly added that he would like to study it if Sri Bhagavan would graciously teach him the meaning. Thus began the disciple’s close association with his Master. Sri Bhagavan started to explain to him slowly and in detail the meaning of each verse, and Lakshmana Sarma, being a lover of Sanskrit, started to compose Sanskrit verses embodying the meaning of each Tamil verse as it was explained to him. After composing each verse in Sanskrit, Lakshmana Sarma submitted it to Sri Bhagavan for correction and approval, and if Sri Bhagavan’s approval was not forthcoming he would recompose the verse as often as was necessary until His approval was obtained. In this way all the verses of Ulladu Narpadu were rendered into Sanskrit within a few months. But Lakshmana Sarma was unable to stop with that. He was so fascinated by the profound import of Ulladu Narpadu that he felt impelled to go on revising his Sanskrit rendering any number of times until he was able to make it an almost perfect and faithful replica of the Tamil original. For two or three years he went on repeatedly revising his translation with the close help and guidance of Sri Bhagavan, who always appreciated his sincere efforts and who once remarked, “It is like a great tapas for him to go on revising his translation so many times.” Because of his repeated efforts to make such a faithful Sanskrit rendering of Ulladu Narpadu, Lakshmana Sarma was blessed with the opportunity of receiving long and pertinent instructions from Sri Bhagavan about the very core of His teachings. 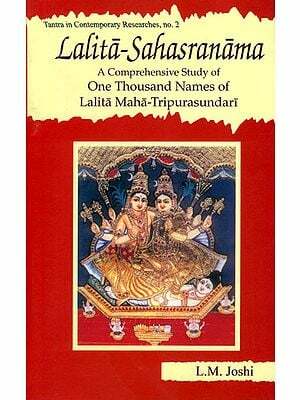 At first Lakshmana Sarma had no idea of publishing his Sanskrit rendering of Ulladu Narpadu, which he was preparing for his own personal benefit, and he had even less idea of writing any lengthy position upon Sri Bhagavan’s teachings. 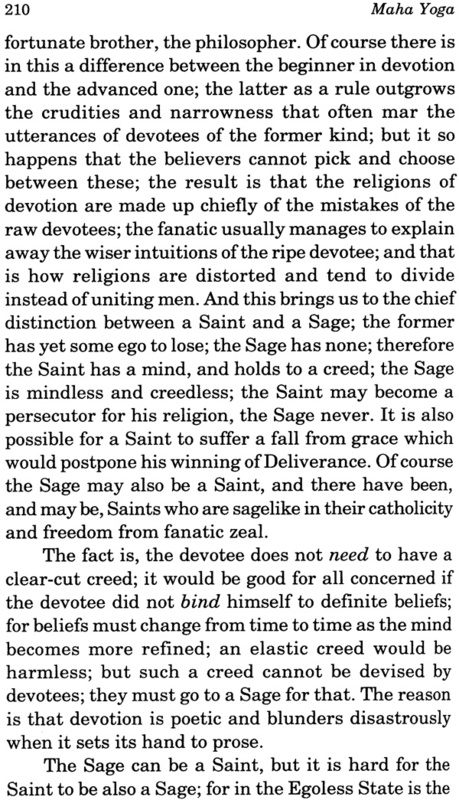 However, towards the end of 1931 a certain book was published which purported to be a commentary on Sri Bhagavan’s teachings, but when Lakshmana Sarma read it he was distressed to see that it gave a very distorted picture f the teachings, so he approached Sri Bhagavan and said in a prayerful attitude, “If your teachings are misinterpreted like this in your very lifetime, what -ill become of them in future? Will not people think that you have approved this book? Should not such a wrong interpretation be openly condemned?” But Sri Bhagavan replied, “According to the purity of the mind (antahkarana) of each person, the same teaching is reflected in different ways. If you think you can pound the teachings more faithfully, you may write your own commentary.” Prompted thus by Sri Bhagavan, Lakshmana Sarma began to write a Tamil commentary on Ulladu Narpadu, which was first published in 1936, and Maha Yoga, which was first published in 1937. In later years Sri Bhagavan once remarked that of all the commentaries on Ulladu Narpadu which then existed, Lakshmana Sarma’s Tamil commentary was the best. In addition to the many verses of Sri Ramana Hridayam and Guru Ramana Vachana Mala which are quoted throughout this book, the author also quotes numerous other sayings of Sri Bhagavan and conversations with Him, particularly in the last chapter. 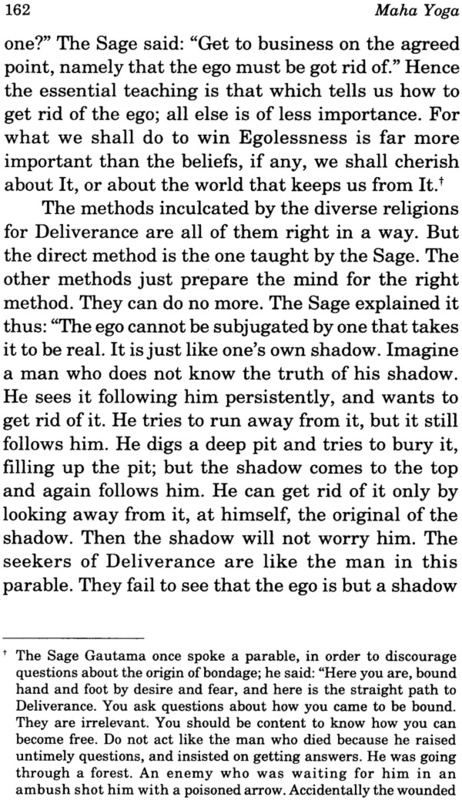 These other sayings and conversations were heard and recorded by the author Jiimself, and proof of their authenticity lies in the fact that most of them have also been recorded either in Maharshi’s Gospel or in Talks with Sri Ramana Maharshi, both of which were published after this book. Since the first edition of Maha Yoga met with such warm appreciation, Lakshmana Sarma was encouraged to revise and enlarge upon it for the second edition, which was published in 1942. The present edition is substantially the same as the second edition, except for a few alternations which were made by the author in the third and fourth editions, and except for appendix C, which was printed in the first edition and which we have decided to include again in this edition. Since the time when the second edition was published, Maha Yoga has been translated and published in a number of other European languages such as German and Portuguese. Finally a word might be said about the title of this book. 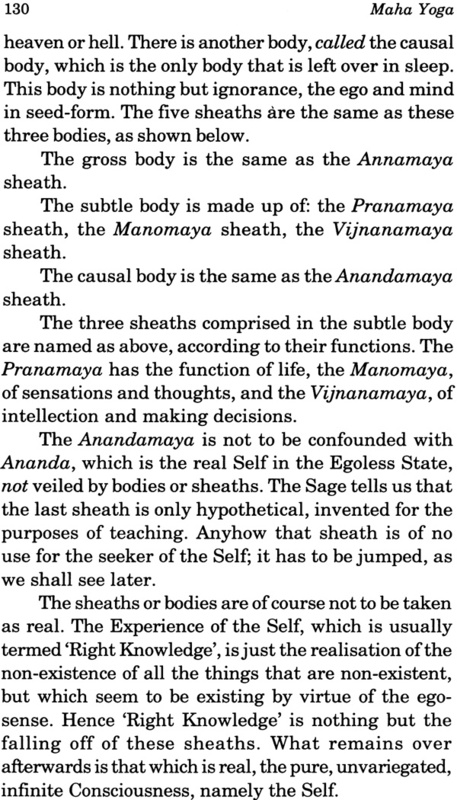 At the end of chapter nine the author writes, “The Sage once told this writer that the Quest is the Great Yoga – and the reason is that, as shown here, all the Yogas are included in the Quest”, and this is why he called this book Maha Yoga. 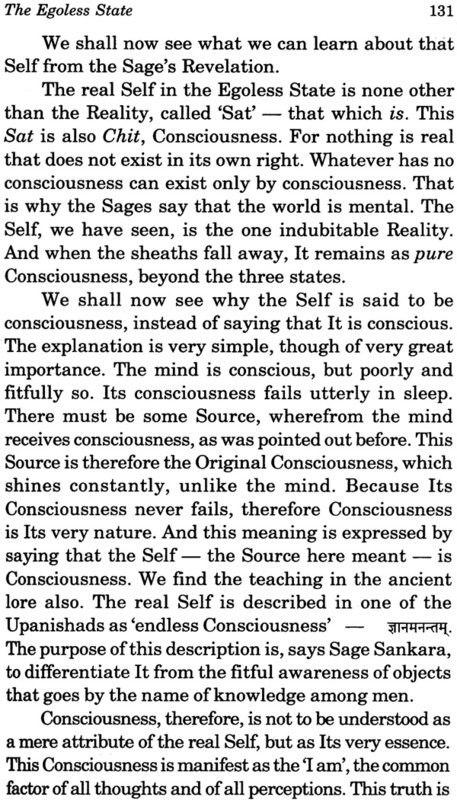 Once, some years after the publication of this book, Sri Bhagavan came across a verse in the Kurma Purana(2.11.7) in which Lord Siva declares, “That (yoga) in which one sees the Self (atman), which is Me, the one immaculate and eternal bliss, is considered to be the Maha Yoga pertaining to the statement Lord.” Since this verse thus confirmed his statement that Self-enquiry, the practice of attending to the Self, is the ‘Maha Yoga’, Sri Bhagavan transcribed it in His own copy of Maha Yoga at the end of chapter nine. We are happy to bring out yet another edition of this valuable book, and we are sure that it will continue as ever before to provide guidance and inspiration to all seekers of truth.